The first members to receive these coveted packets of delicious coffee will be those who have taken up the #HAHD 4 Marathon Challenge in a big way by already completing their first 100 articles! 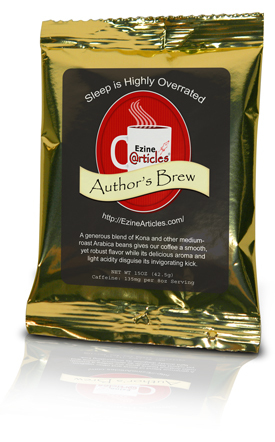 Those 75 members will not only enjoy the benefits of increased traffic, heightened exposure and awesome credibility, they’ll also get to enjoy a fabulous cup of Author’s Brew coffee. The next batch will be sent out to all #HAHD 4 qualifiers – along with a mug and coaster to complete the set. Before wrapping up this post, I wanted to share the following free-verse ode to Author’s Brew written by Justin, a member of our Editorial Team. My daily support which provides me with caffeine to gently accelerate my day and the antioxidants I need to feel better about my relationship with you. I believe too much of you is a good thing, even though some might disagree. The other day you seemed a little different, though. You weren’t as bitter as you sometimes can be, as if a weight had been lifted from your shoulders. You also had an extra kick that I crave more of. Do I dare say “invigorating”, or would this offend the sensibilities of the company you normally keep in Folgerland? Perhaps the gold and shiny new appearance you have is an indication that you are becoming more cultured, more refined. There’s been a rumor that you are setting out for new territory, namely to enrich the lives of our authors here at EzineArticles and to put new pep into their writing efforts. If this is the case, you are dressed up just right for the occasion! Alas, if you want to make new friends and inspire others, you have my support. Who am I to stand in your way? With my head hanging low, I’ll try to enjoy the remnants of roasted awesomeness you’re leaving behind. Back in Folgerland I will remember and savor the time I had with the newly blended you and await your return. In my humble yet discerning coffee-loving opinion, what I’m trying to say is, I like the new you! Oh coffee, I love you. Some elegant, delicate, sweet roast prose. It really was good as a joke, I still mention it. It is an even better reality. Sleep is definitely over rated. Thanks for the lovely surprise that arrived this morning in the mail. Some very nice cups of coffee indeed, and I really want to say heartfelt thanks for this wonderful gift.